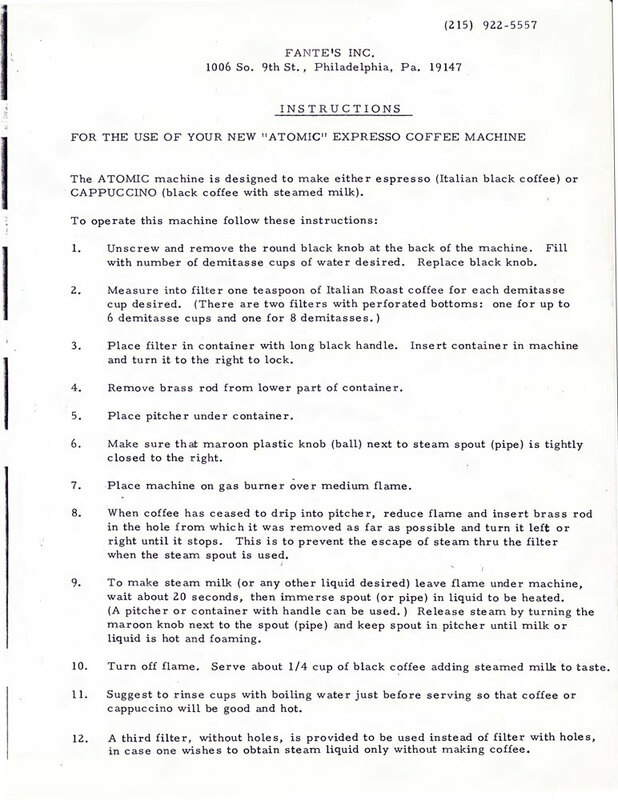 The Atomic machine was designed to make either espresso (Italian black coffee) or cappuccino (Italian coffee with steamed milk). Unscrew and remove the round black knob at the back of the machine. Fill with number of demitasse cups of water desired. Replace black knob. Place filter in container with long black handle. Insert container in machine and turn it to the right to lock. Remove brass rod from lower part of container. Make sure that maroon plastic knob (ball) next to steam spout (pipe) is tightly closed to the right. Place machine on gas burner over high flame. When coffee has ceased to drip into pitcher, reduce flame and insert brass rod in the hole from which it was removed as far as possible and turn it left or right until it stops. This is to prevent the escape of steam through the filter when the steam spout is used. To make steamed milk (or any other liquid desired), leave flame under machine, wait about 20 seconds, then immerse spout (pipe) in liquid to be heated. (A pitcher or container with handle can be used.) Release steam by turning the maroon knob next to the spout (pipe) and keep spout in pitcher until milk or liquid is hot and foaming. Turn off flame. Serve about 1/4 cup of black coffee adding steamed milk to taste. Suggest to rinse cups with boiling water just before serving so that coffee or cappuccino will be good and hot. A third filter, without hole, is provided to be used instead of filter with holes in case one wishes to obtain steam liquid only without making coffee. This is just for the purpose of steaming liquids. 1. Season machine by filling it with water to capacity through the round opening at the rear of the neck. Screw on the safety valve knob, put a little DRIP GRIND espresso coffee in one of the filters, put the filter into the filter holder and then clamp it into the head of the machine. 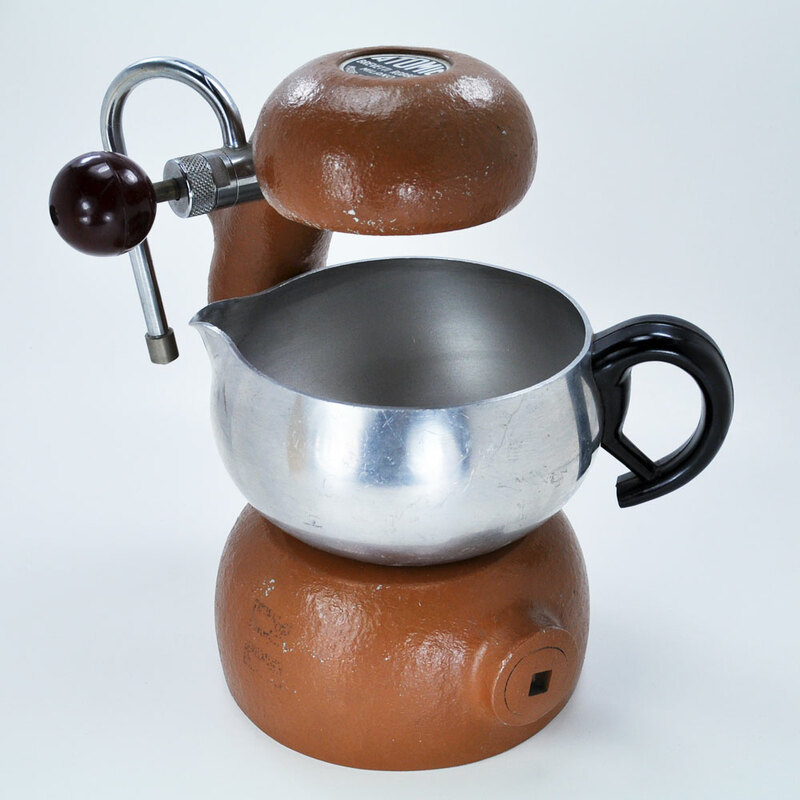 Check that the Cappuccino (knob) Valve on the side is closed and place the machine over a burner. Place the large coffee pitcher under the head of the machine and turn on the heat. After a short period when machine has rendered most of the water from the tank, it will labor and spurt. Turn off the heat, open the Cappuccino Valve first, in order to release any stored steam pressure, then unscrew the safety valve knob at the rear and pour out any residue water. Machine is now ready for use. 2. To save energy refill with hot water to capacity and replace safety valve knob. Never use brewed coffee instead of water. 3. Fill the larger of the two filters 3/4 full with DRIP GRIND espresso roast coffee ONLY (never with a very fine or fine grind – this will cause machine to malfunction, because it does not have hydromatic pressure). Have your coffee merchant give you DRIP grind only or use DRIP grind canned espresso. 4. Place filled filter into filter holder and lock it into the head. Check that Cappuccino valve is closed, replace the coffee pitcher and put the machine over moderate heat. 5. When machine has reached the boiling point, it will slowly start to render brewed coffee. The coffee will escape faster as machine gets hotter. When the coffee pitcher is quasi full and the speed of escaping coffee lesens to a slow spurt, then inject the brass pin with knob all the way into the horizontal opening at the bottom of the filter holder, give it a twist and wait a few minutes until the machine turns the residue water in the tank into steam. The brass pin is to be used only when the coffee spurts and labors. It won’t shut off a full flow of coffee. It is normal for some coffee to spout out of the sides and bottom of the filter holder when closed off with the brass pin. 6. For best results- make coffee first- open Cappuccino valve to release steam pressure, replace coffee filter with Aluminum non perforated cup, lock it into head, refill half water and proceed to steam when ready. To frothe the milk, place about 2 oz. cold milk or a mixture of 2 oz. water and 1 Tb. powdered milk in an ordinary tea cup, place it under the steam stem with tip of stem slightly submerged under the surface of the milk. Blast the milk – and immediately close the valve – re-open and close slowly as needed while milk rises. Pour or spoon frothed milk over coffee or pour coffee down the side of the cup. Sprinkle with chocolate. 7. For smaller amounts of coffee use less water and the smaller coffee filter. 8. If knob of Cappuccino valve hard to turn, unloosen the stem ring. 9. ALWAYS UNLOOSEN the Safety Valve Knob when storing machine, in order to prevent corrosion of the knob. For best results in frothing milk on a machine with a pressure gauge, follow instructions as given in par. 6 above and wait until gauge reaches 3 kg. Do not overheat machine or plastic dial cover will melt. The plastic piece is replaceable. If gauge indicator recedes to zero while machine is in operation, turn off the heat, this indicates that the water has been completely depleted. Using ordinary tea cups, steam 1-1/2 oz. of milk, or a mixture of 1-1/2 oz. of milk and half-and-half, or 1-1/2 oz. of milk mixed with 1 tsp of powdered milk, or 1-1/2 oz. of water with 1 Tb. of powdered milk. You can also use a small container with a handle or Turkish Coffee Pots and froth as directed. If using pots, you can spoon out the frothed milk. Mix sweet ground chocolate and milk, heat with steam valve, and add about 3/4 oz. of Brandy for each 5 oz. serving glass. Heat milk on seam valve and add 3/4 oz. Kahlua for each 5 oz. serving. Prepare essence: To 1-1/2 cups of water add 1/2 cup of sugar and the peel of a half of lemon, 3 inches of cinnamon bark, 10 cloves, and boil for 10 minutes. Allow to cool and strain. For each serving add 1 oz. of essence to 3 oz. of Burgundy or Claret wine and heat on the steam valve. Garnish with a small slice of orange peel and sprinkle with nutmeg. Essence serves from 8 to 10 drinks. Perfect for after skiing. Into a cup of Apple Cider, add one slice of an orange and one strip of lemon rind, heat on steam valve and sprinkle with cinnamon. 1 oz. Byrrh (French Aperitif), 1 oz. Sweet Vermouth, 1 oz. Burgundy wine. Mix and heat in glass. Garnish with an Orange Peel. Heat 4 oz. of milk and add 1 oz. of Brandy. To 4 oz. of Coffee add 1 oz. Brandy, garnish with a strip of lemon peel and add sugar to taste. To 4 oz. of Coffee add 1 oz. of Irish Mist. Top with whipped cream. To 4 oz. of Coffee add 1 oz. of Brandy. Top with whipped cream. Break an egg into a custard cup, submerge the steam stem half way down along the side of the cup, turn on the steam and revolve the cup, always keeping the steam stem against the side of the cup in order not to break the egg yolk. Raise and lower a needed. If so desired you may butter the sides of the cup. When coddled salt and pepper to taste. Break 2 eggs into a large tea cup, mix them lightly with a fork, submerge the steam stem half way down the center of the cup, turn on the steam and revolve the cup until all done. Salt and pepper to taste. Before steaming you might want to add a 1/2 tsp. of butter.